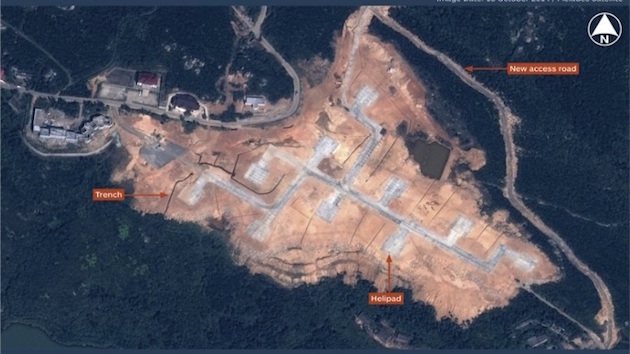 Construction of a helicopter base on Nanji Island was observed by a commercial spy satellite in October. The island is off the coast of Zhejiang province—some 186 miles northwest of the Senkakus, a group of resource-rich islets China calls the Diaoyu Islands. "China's new heli-base on Nanji Island demonstrates that the PLA is preparing for an offensive military operation against the Senkaku/Daiyoutai Islands," said Rick Fisher, a senior fellow with the International Assessment and Strategy Center. "If you want to rate the level of tension, this is the PLA reaching for its holster. When forces start deploying to Nanji Island, that means the hammer is cocked." The military buildup on Nanji was first disclosed by Japan’s Kyodo News Service last month. Kyodo, quoting Chinese sources, said a landing strip was being built. However, the satellite photos, reported last week by IHS Jane’s Defence Weekly, a trade publication, did not indicate construction of an airstrip, only helicopter landing pads. The helicopter pads are an indication that China plans to use the base for transporting troops and forces by helicopter and not for longer-range air transports or fighter jets. China has been engaged in a tense confrontation with Japan over the Senkakus since 2012, when Tokyo, in a bid to clarify the status of the uninhabited islands, purchased three of the islands from private owners in a bid to prevent Tokyo Gov. Shintaro Ishihara from buying them. Since then, Chinese ships and warplanes, as well as unmanned surveillance drones, have been flying close to the islands, prompting numerous Japanese maritime and aerial intercepts. Jane’s reported the helicopter base construction is new. The construction is not visible in photos taken earlier than October 2013. Wind turbines also are visible additions to the island that are located on a ridge on the southeast part of the island. Radar and communications equipment also is visible. China’s Defense Ministry did not dispute the military buildup on Nanji. PLA Sr. Col. Yang Yujun told reporters in Beijing Dec. 25 that Japanese news reports of the construction were "irresponsible." "There is no doubt that China has the right to conduct activities and construction on its own territory," he said. "Some media in Japan make irresponsible speculations on China’s legitimate activities and construction and play up tensions in the region. It is pure media hype." Questions were raised during the discussion with Yang as to whether the buildup is part of China’s declaration of an air defense identification zone over the East China Sea that covers the Senkakus. The U.S. government has said it does not recognize the Chinese air defense zone as it covers large areas of international airspace and waters. Jane’s said the Nanji construction appears to be part of a "quiet military buildup around the Senkaku/Daioyu islands by both sides." "For its part, Japan is putting aside funds to buy land for a coastal surveillance radar unit on Yonaguni island, which is the westernmost of its islands and only 150 kilometers from the Senkaku/Diaoyu islands, while it is also training up and kitting out a small marine corps-style force that will be based in Nagasaki," the report said. The lack of an airfield is a "gap" in Chinese plans for military operations against the Senkakus, Jane’s said. The closest PLA air base to the Senkakus currently is located at Luqiao, some 236 miles from the Senkakus, where J-10 fighters are based. Fisher, however, said Nanji could be used by the PLA to base its large Zubr air-cushioned hovercraft that are capable of moving troops and tanks in a takeover of the Senkakus or an assault against Taiwan. A Japanese Embassy spokesman declined to comment on the Chinese military construction. "We are in the process of gathering information on this, and thus not able to comment," the spokesman said. A Pentagon spokesman did not respond to an email request for comment. Retired PLA Maj. Gen. Xu Guangyu, a senior adviser at China Arms Control and Disarmament Association, a Beijing-based research group, told Singapore’s Today newspaper the Nanji military construction was "normal." "China has military bases in several strategically important coastal islands and the Nanji is one of them," Xu was quoted as saying Dec. 23. "The Japanese media is only singling out the Nanji and making a big fuss, [and] this can be misleading." This entry was posted in National Security and tagged China, Japan, Senkaku islands. Bookmark the permalink.